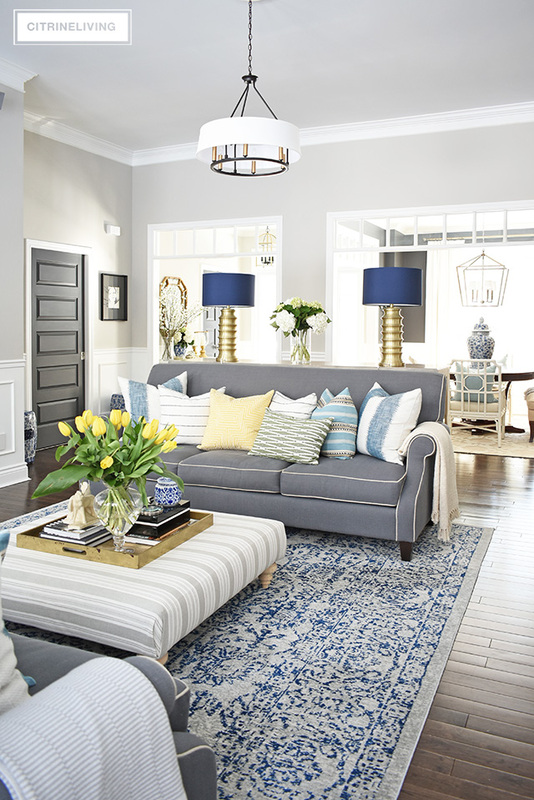 I shared my spring living room with you last month (see it here), and I promised that this post was coming shortly after – it took me a little longer than I thought it would to finally get it published…is it just me, or has this spring been crazy busy for you too? It seems like I’m never stopping! If you’re busy like me, try to take a minute, grab a coffee, sit back and read! 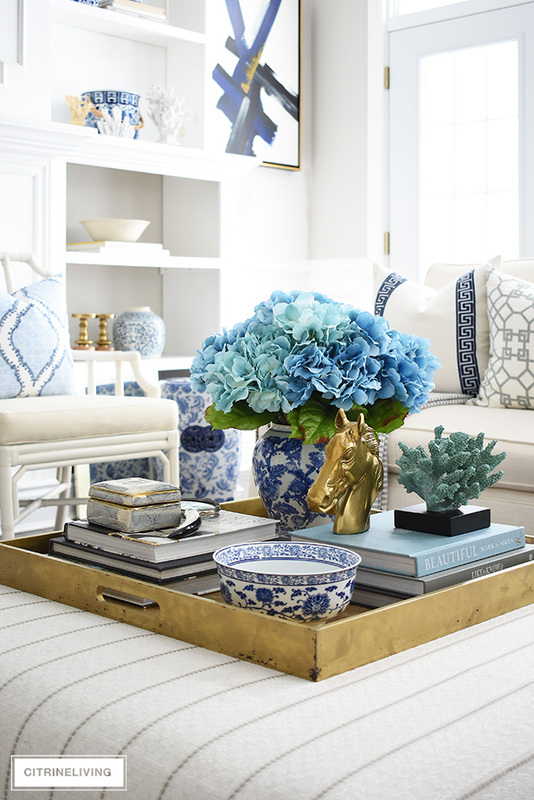 I wanted to give you a closer look at my spring coffee table decorating for a couple of reasons… 1) I don’t always show closeups of how I’ve arranged my ottoman each season, and 2) I wanted to share a few no-fail tips that I fall back on, that always give me a beautifully styled vignette, no matter what time of year it is. 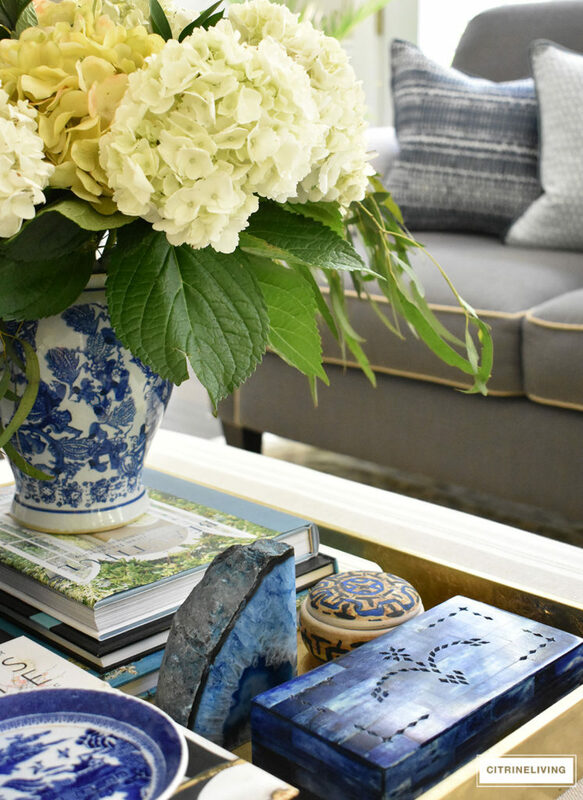 I’ve shared coffee table decorating and styling tips in the past as well, in one of my most popular posts, 3 Ways To Style Your Coffee Table or Ottoman, with some more specific looks that you can create. 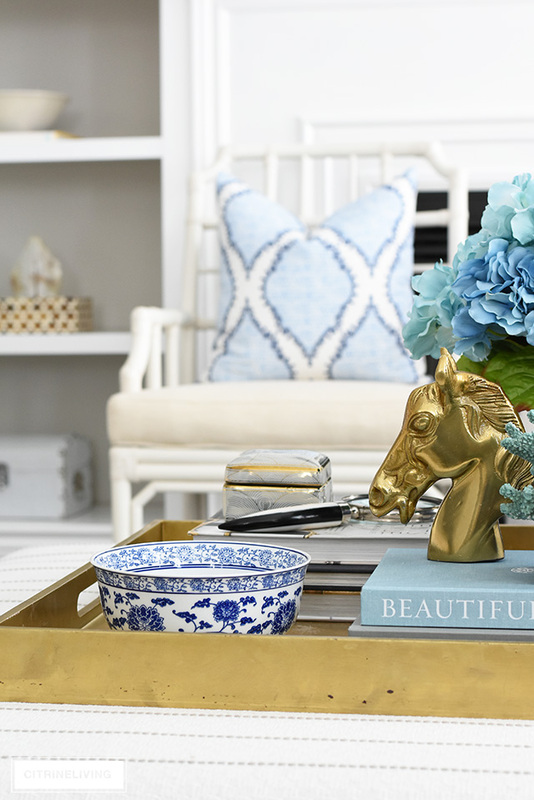 Today, I’ll sharing more general styling tips, that will help you create a coffee table display that you love. 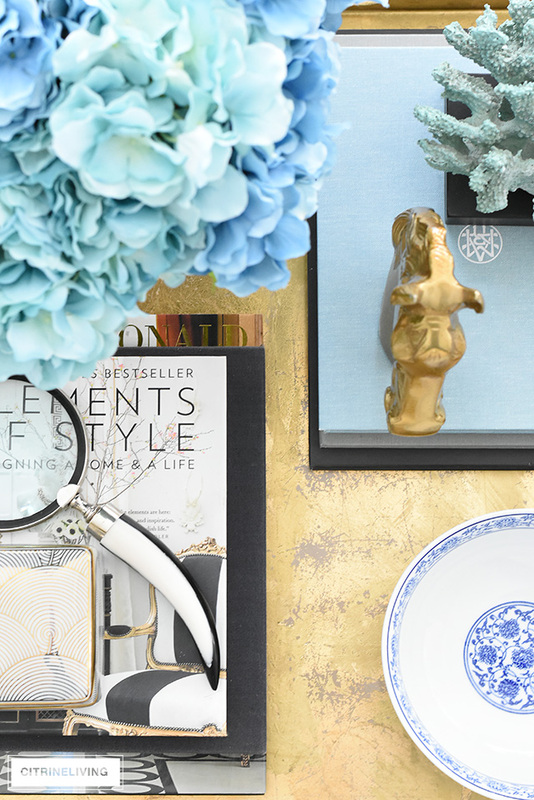 I always use pieces and objects that I love and have meaning to me when I’m styling my coffee table (or ottoman, in this case). Our ottoman is 40 inches square, which is a good size, and takes up a lot of floor space in our living room. Having such a large surface area to work with, you’ll always find this large gold tray on here. I use it as a base to coral my favorite pieces. It is in need of some TLC however – this was a DIY gold leaf project from a few years ago, and I think it’s gotten just a little wear and tear since! 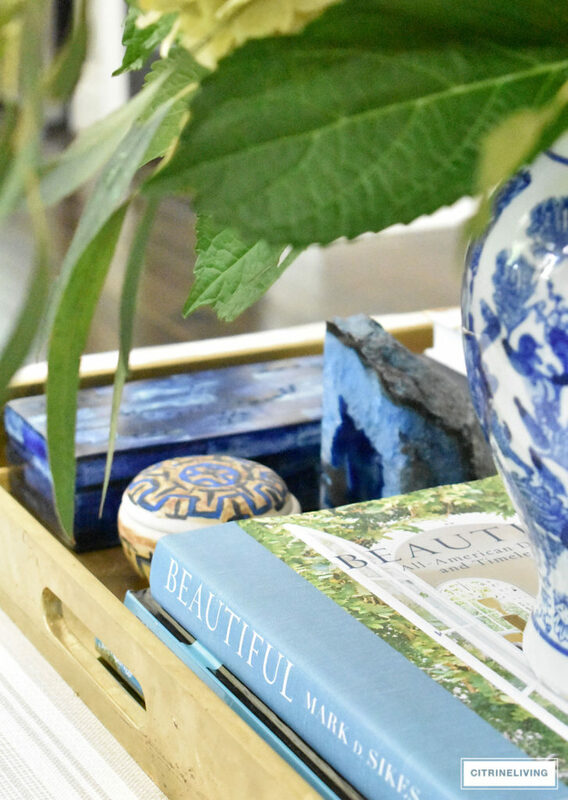 Hands-down, using tray is a perfect way to create a beautifully styled vignette, because it contains your items, and grounds them. That’s not to say you cannot use one, though! 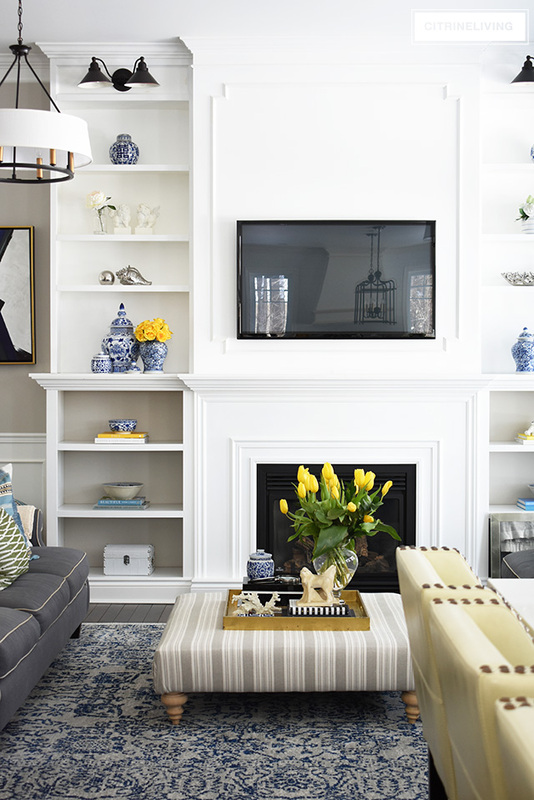 Just be mindful to use larger items, like stacks of larger books, to anchor your display. 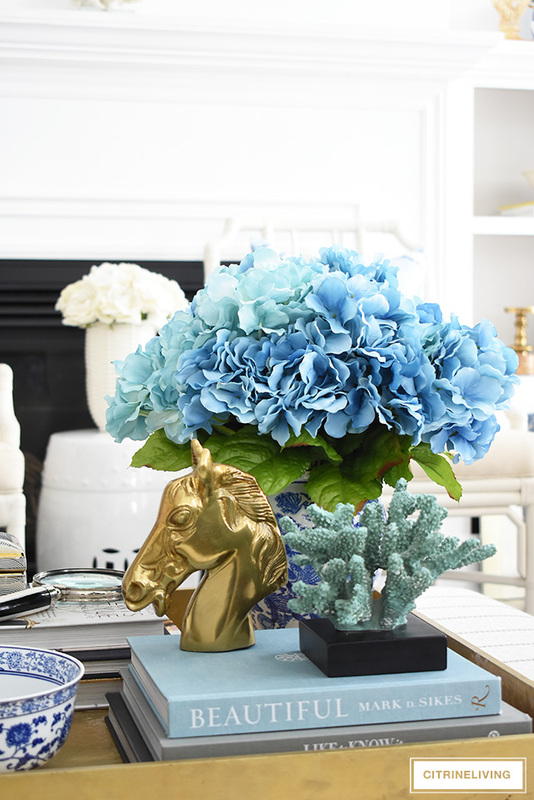 This spring, my color palette is loaded with blue, white and brass, and my faux blue hydrangeas have taken center stage throughout our home lately. 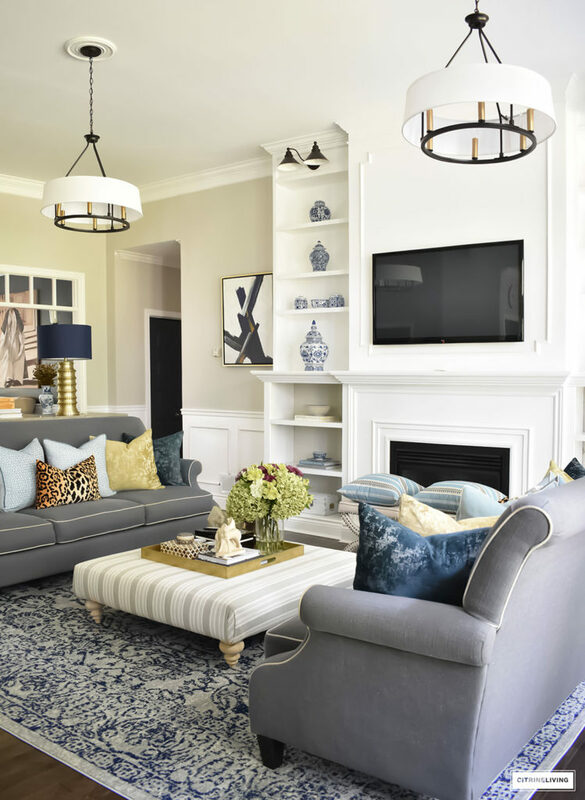 You’ve seen them in all off my spring posts, and I absolutely love the vibrant pop they bring to this room, which is otherwise quite neutral. Using a floral arrangement for your coffee table decorating is perfect for adding an organic element to your display (even if it’s faux!) and some beautiful color and texture. 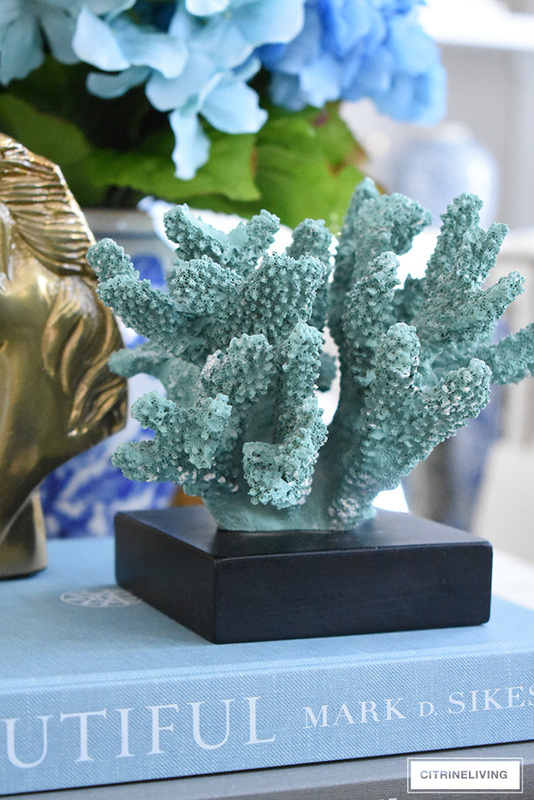 I love different types of natural curiosities, and this spring I’ve sprinkled my coral sculptures all around our home. 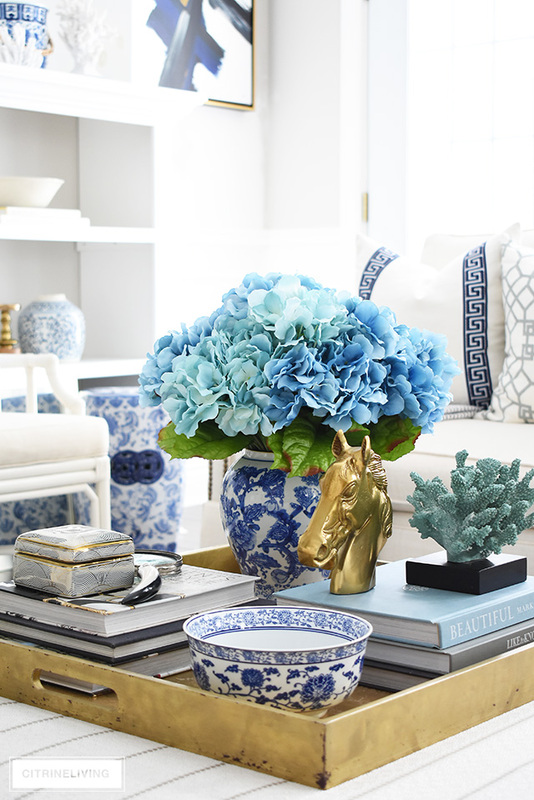 If you saw my entryway post last week (see it here), you noticed that my console table was full of them. They add so much texture and visual interest, and for spring and summer, they’re the ideal piece to pull out. Like a floral arrangement, they add an organic element to your display. My turquoise coral was a gift from a dear friend and I cherish it so much! 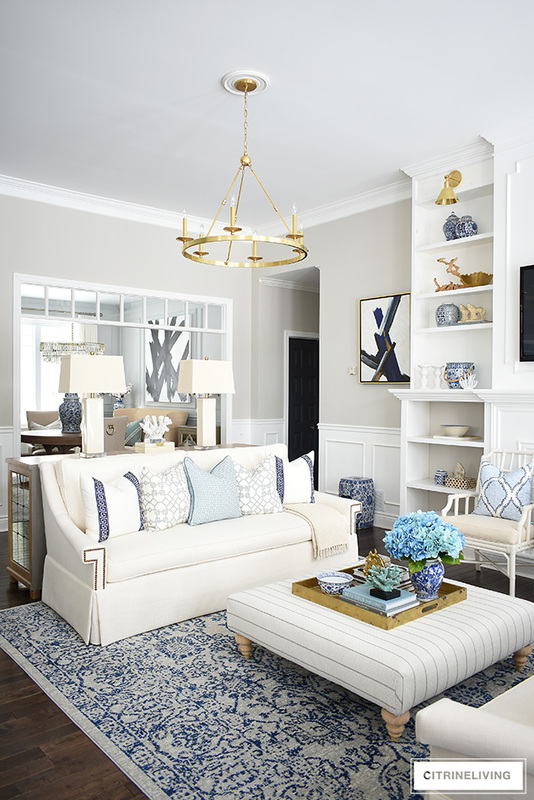 It’s beautiful, has meaning, and works perfectly into my spring color palette and decorating theme too. 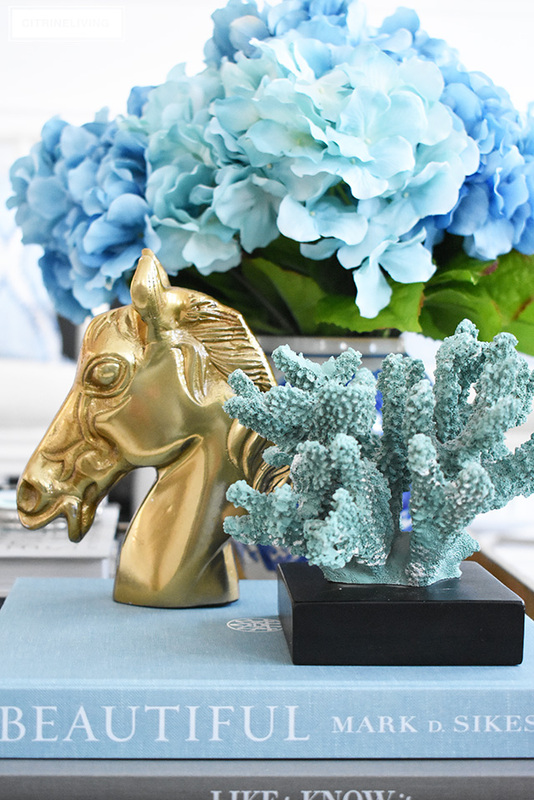 I love this brass horse as much as my coral – he was a HomeSense purchase that I knew I had to have. 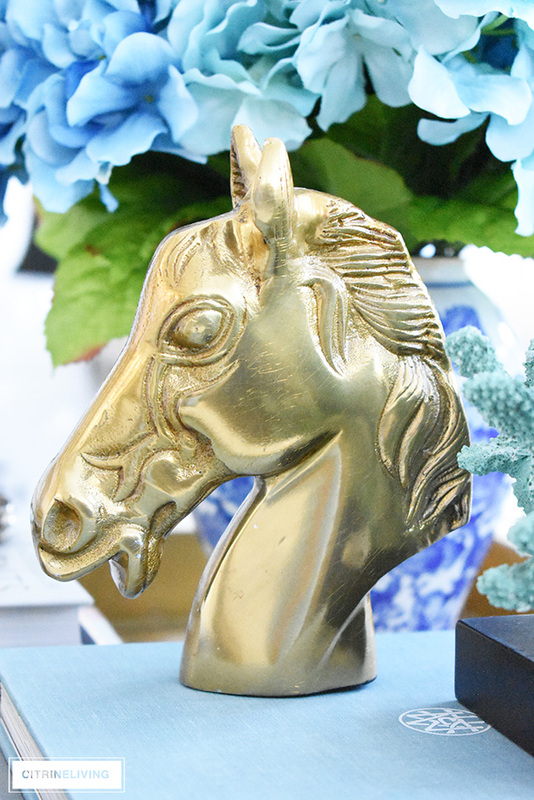 I love horses and I love brass, so it was a no-brainer for me. When I’m purchasing accessories I always remind myself to buy items that have some meaning to me, or that I truly love. 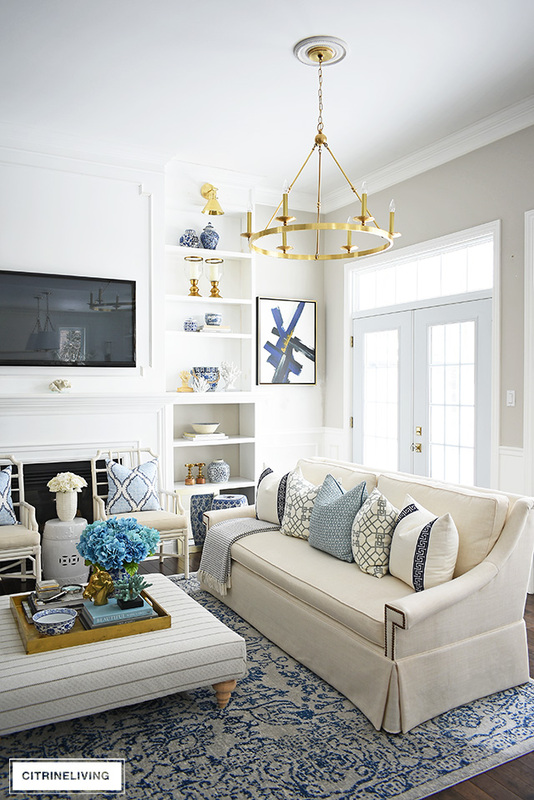 It’s very easy to find yourself with a cart full of pieces you really don’t need – always ask yourself if you can picture it as a forever item – will it last and can it be used anywhere you use it? One of my favorite bowls (which I also use for food, by the way) is another perfect addition to my spring display. 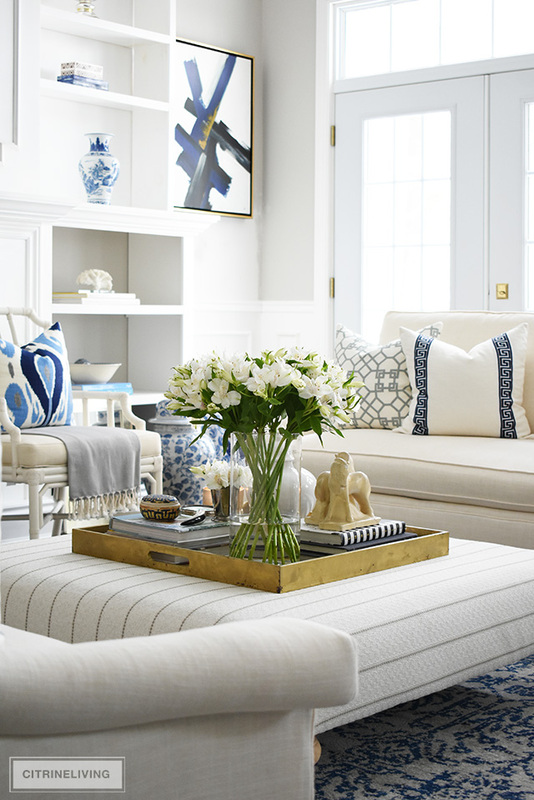 It adds another touch of blue and white, it balances out the color combination on this tray, and it also helps to pick up the pattern in our rug. There’s a lot of blue elements happening here, but it isn’t overpowering since it’s tempered with all of the other items that are gold, black and white on the tray as well. TIP #5: BOOKS, BOOKS + MORE BOOKS! Books (on any topic you love!) are another fabulous way to build your displays. I talk about using them often in my posts, because they are another staple throughout our home. I collect design books because I read them and love them. Stack some books and prop any decorative object on top, it’s the perfect way to ground any accessory and it always gives it more importance as well. 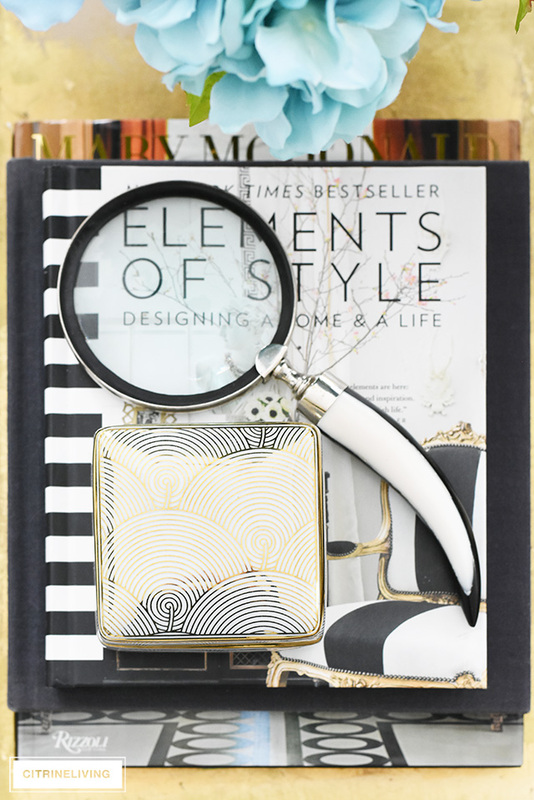 I used a new favorite decorative box and my magnifying glass here. Both add interest with their shape and pattern. LOOKING BACK AT SOME OF MY FAVES! I always love to look back at my previous seasonal decor posts and home tours to get ideas and inspiration for what I’m doing next. Taking stock of what I’ve created in the past is a great way to create something new for now. Here’s a look back at some of my favorites! You’ll notice my gold tray of course, but have close look at how I’ve used different favorite pieces to create something new each time – decorative boxes, design books, beautiful and unique dishes, natural curiosities, florals, lanterns… the possibilities are endless. Click the titles of each one to visit the tour! 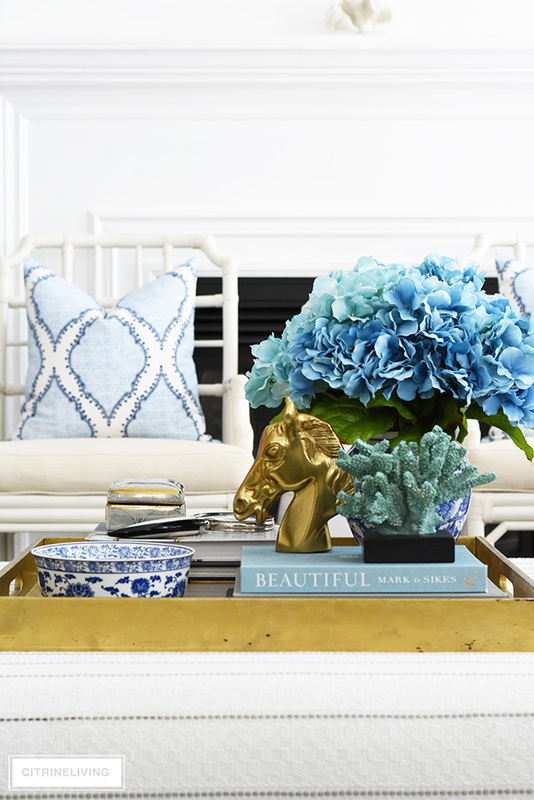 4 Comments on SPRING COFFEE TABLE DECORATING + STYLING TIPS! You spring coffee table is so lovely, as are all of your home arrangements. Can you post a link to a large gold square tray? The link you posted is to smaller, rectangular trays on Wayfair. Thank you! Hi Edie, Thank you so much, I’m so happy you like it! Unfortunately I don’t have an excel link! This tray is years old and I’ve since had trouble finding an exact one to link – I am so sorry!! When I do find one, I will be sure to link it! Thank you so much for reading! 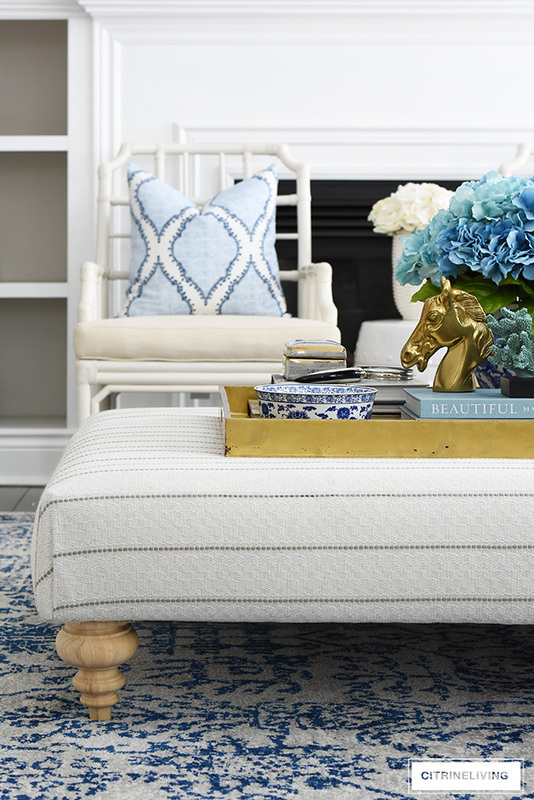 I love how you styled your Spring ottoman, so beautiful. Thank you for the tip, only buy items you love and have meaning. I will definitely implement this when shopping. Thanks for sharing your space and knowledge with us.